This page describes how to achieve logging of student-tutor interactions with Flash tutors. Logging is natively supported with tutors built with the CTAT Flash components. To log data appropriate to your study, logging must be configured. Delivery application: a web application such as OLI or TutorShop that sequences and delivers the tutors in HTML. If not using a delivery application, use the CTAT publishing template. Flashvars: You specify background data for logging using Flashvars, a standard mechanism for passing parameters to Flash movie in HTML. For example, you can specify the experimental condition. 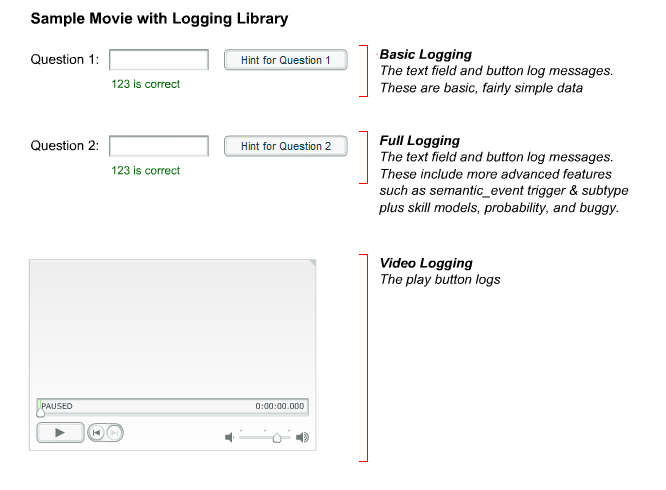 Logging Library: the Flash Logging Library must be in an accessible place—either on the computer delivering the tutor or on a web server. Specify the location of the library with the LoggingLibraryPath flashvar or in the Logging Library property of the CommShell. You can use the hosted logging library at http://learnlab.web.cmu.edu/swf/CommLoggingLibrary.swf. As shown in Figure-1 above, logging parameters are specified for a tutor via the FlashVars mechanism. Flashvars are presented in HTML for the tutor to use, but your delivery environment may require that you specify them in another format. OLI, for example, requires that flashvars are specified in their XML format. The CTAT_FlashPublish template is supplied to provide a starting point for making the HTML file, and the Flash IDE allows you to choose this template when publishing the tutor. For more on how to specify flashvars and to see which parameters are required, see the CTAT flashvars reference page. The CommShell component reads logging parameters from flashvars and makes calls to the logging library during tutoring. Important: the CommShell version in the tutor must be compatible with the logging library version. If you do not use compatible versions, logging will not occur properly if at all. In Table 1 above, compatible versions are listed by column. Select CommShell on the stage. Set its Behavior Recorder Mode to AuthorTime in the Parameters tab of the properties panel. The version number should appear in the gray status bar at the top of the CommShell instance (see Figure 2). If no status bar appears, your CommShell is likely to be older than version 1.6. Alternatively, set CommShell's Include Traces parameter to 'true'; then test the movie. A version number trace will appear in the output panel for versions 2.1 and later. Open CommLoggingLibrary.swf in the Flash player or web browser and right-click (Windows) or Ctrl+click (Mac) the blank movie. A context menu will appear (versions 2.1+) displaying the version number of the SWF and the DTD version to which it conforms. If no version information appears in the context menu, the version is likely to be 1.x or lower. If you need to upgrade CommShell in your tutor, complete the steps below. Install the desired CommComponents MXP (more detailed instructions). Drag the new CommShell component onto the Flash stage. A "Resolve Component Conflict" prompt will appear. At the "Resolve Component Conflict" prompt, choose "Replace existing component" and press OK.
Delete the extra CommShell that appeared on the stage. Repeat steps 2-5 for any other tutor interfaces you wish to modify. The logging library sends appropriate log data to a logging server (such as the PSLC's) as directed by the Flash tutor. The logging library, itself a SWF file, must be accessible by the tutor at the time of tutoring for log actions to be recorded. You can use the logging library in place on the LearnLab server (this is the version 2 SWF corresponding to DTD version 4), or you can download and copy the logging library to a location of your choice. Download the logging library (FlashLoggingLibrary2.0.zip). This file is also included in the CTAT installation in the Flash subdirectory of your CTAT installation folder. Extract the logging library SWF (CommLoggingLibrary.swf), located in the /Installation subdirectory of the zip file, to a location where your tutor can access it. LoggingLibraryPath: the relative path from the HTML document to the logging library SWF, including the name of the logging library file. You may want to place the logging library SWF in its own directory. In this case, you would refer to the path and the file (e.g., webContent/CommLoggingLibrary.swf). Note that when running from a web environment such as the OLI online course delivery system, it is common practice to put the HTML (learning pages) inside one directory and the media files (e.g., .SWF, .GIF, etc.) inside another directory (e.g., WebContent). You should modify the path accordingly. Important: You should test and verify that you are logging from your delivery environment, and that this data is accurate and expected. For a complete discussion of testing and troubleshooting logging, see Troubleshooting logging from Flash tutors. Also, see CTAT FlashVars documentation for a description of all logging parameters. The logging library comes in the form of a SWF file named CommLoggingLibrary.SWF. This library has a public API for sending logging messages. ActionScript calls to this API are necessary to invoke logging. Download the logging library (FlashLoggingLibrary2.0.zip). Extract the logging library SWF (CommLoggingLibrary.swf)—located in the Installation subdirectory of the zip file—to a location where your SWF can access it. // Create a loader object. // overcomes a scoping problem with event handlers. // initialized and is ready to use. // call onLoadStart, author defined method, when loading starts. // Useful for a pre-loader. Log messages with the logging methods; this documentation is also located in the Documentation folder that comes with the logging library. The library includes several methods for logging. 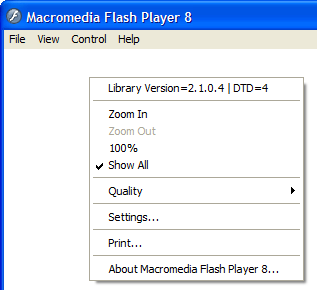 The CTAT Logging Library comes with a sample Flash application that implements logging with standard Macromedia components. This sample application is named SamplewithCommLoggingLibrary and can be found in the /Sample directory of the logging library ZIP, or the /Flash/Sample subdirectory of the CTAT installation. The ActionScript for this sample is available in Frame 1 of the sample file (.FLA). A sample application for learning how to call the CTAT Logging Library.